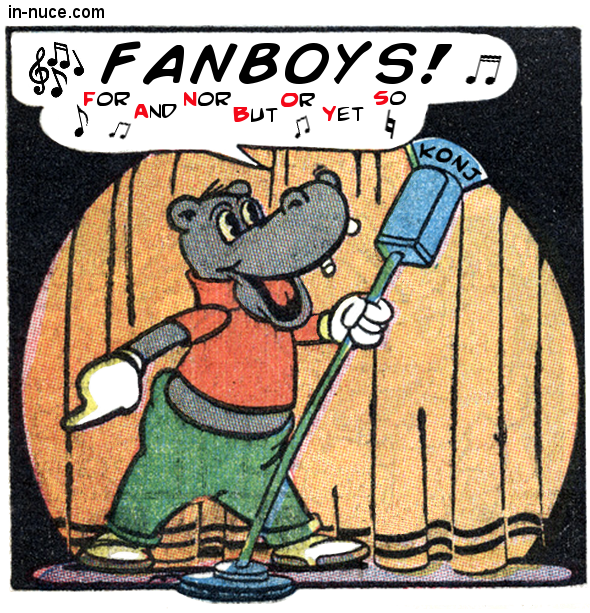 The singing hippo twittered and twilled for his jubilant fans. A conjunction connects words, groups of words, or propositions. 1. Conjunctions may connect words. The singing hippo twittered and twilled. In this sentence “and” joins, or connects, the two verbs “twittered” and “twilled”. 2. Conjunctions may connect groups of words called phrases. The hippo lilted up the scale and down the scale. In this sentence “and” connects the two prepositional phrases “up the scale” and “down the scale”. 3. Conjunctions may connect propositions called clauses. The hippo sang off-tune, yet the crowd roared its approval. In this sentence “yet” connects two clauses: “The hippo sang off tune” and “the crowd roared its approval”. 4. Words used as conjunctions in one sentence may be used as a different part of speech in another. a. “For” and “but” may be used as conjunctions. The singing hippo twittered and twilled, for his heart was buoyant. In this sentence “for” is a conjunction connecting the clauses “the singing hippo twittered and twilled” and “his heart was buoyant”. b. “For” and “but” may be used as prepositions. In this sentence “for” is a preposition beginning the phrase “for his jubilant fans”. Connecting conjunctions are also called coordinating conjunctions. 5. When diagramming, a conjunction is placed with the elements it connects. In the diagrams below, the conjunction are printed in italics. They can be underlined in written diagrams.